During the Spring and Summer, I love to make fruit desserts. With the fruits in their prime it is the best time to enjoy the flavors. I especially love strawberries. I am constantly making a new batch of biscuits for strawberry short cake. However, I have another all time favorite involving strawberries and that is strawberry-rhubarb pie. The combination of sweet and tangy is irresistible! Each year, I make the following recipe at least a couple of times. My husband loves it as much as I do so it’s always a fight to get to that last piece. We grow rhubarb right at the house so I pretty much have to make this to use up that wonderful rhubarb…such a problem! Hull the strawberries and cut each one at least in half. Cut the rhubarb into 1/2 inch pieces. If you are using frozen rhubarb, just thaw and drain it. Gently toss strawberries and rhubarb with sugar, flour, tapioca, vanilla, and salt, in a large bowl. Let this mixture stand for about thirty minutes until the tapioca is softened. Stir occasionally. If you are making your own pastry, this is a good time to prepare it. Roll out two thirds of the dough into a 16 inch round and place the dough in a deep dish pie plate. Roll out the remaining dough and cut it into ten strips with a pizza cutter or fluted pastry wheel. This will be used for the lattice top. Spoon the softened strawberry and rhubarb mixture into the crust. Cut margarine or butter into small pieces and sprinkle on top of the mixture. Place five of your pastry strips across the pie filling about one inch apart. 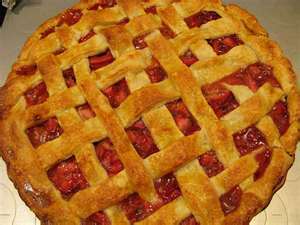 Take the remaining five strips and weave them across the pie going the opposite direction to form a lattice design. Trim the ends and moisten with water to seal. Bring the crust overhang up over the strips and pinch edges. Brush the lattice with milk. Bake pie for 50 minutes or until the fruit mixture begins to bubble and the crust is golden brown. Let the pie stand for about one hour to let the juices settle.